Miller Performance is a pioneer of air to liquid charge cooling on BMW engines. Since 2005, Miller Performance has designed and used air to liquid cooling systems exclusively for our turbo builds. With our vast practical knowledge and reputation for high quality and functionality, our new BMW M3 and M4 air to liquid intercooler does not disappoint. Providing higher flow capabilities and better cooling efficiency than the factory intercooler, your m3 or M4 along with whatever other mods you currently have will performance better than ever. The factory BMW intercooler core is quite restrictive. It measures 10.75" x 5.375" x 3" While that may be good enough for stock, that is where it ends. The factory rarely, if ever, designs parts or systems for AFTERMARKET performance growth. The Factory cooler, which looks ugly and unfinished by the way is sized only for the stock power level. It's lack of flow capacity hinders top end power which is one of the reasons this engine is all done after 5.5K RPM. The factory cooler is also not as efficient at cooling as it needs to be for higher boost and power levels. The tube and fin design is less efficient at exchanging heat than the bar and plate setup we use in our cooler. The factory cooler is also a "single" pass cooler. What that means is that the liquid flows through one side and out the other. When fluid moves to fast through the core, it is not absorbing as much heat as it possibly can. 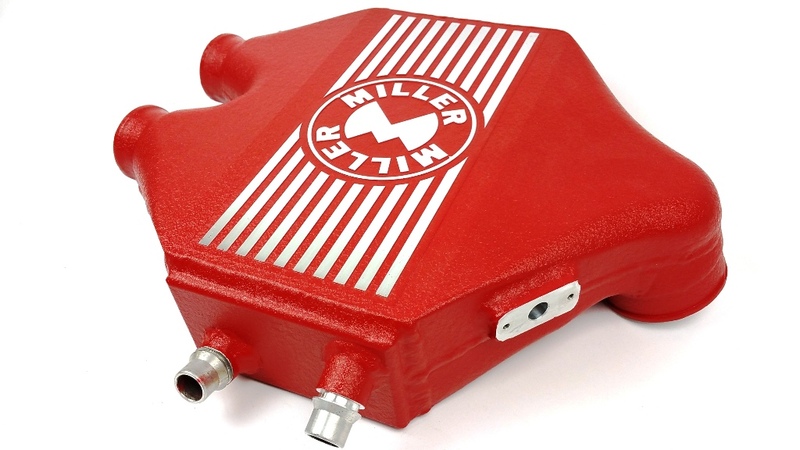 The Miller M3 & M4 Air to Liquid intercooler is machined from billet 6061-T6 aluminum, right here in the USA and uses a more effective Bar and Plate core design to promote better heat transfer. The all aluminum construction will provide better longevity and prevents catastrophic failures associated with higher boost and plastic that becomes brittle over time and heat cycles! It is also a "dual" pass cooler. The intercooler fluid goes travels into the core from the front, loops around to the back and returns out the front at the opposite side. This has been designed to keep the fluid in the cooler core just long enough to absorb as much heat as possible. Our Cooler core also measures 12" x 6" x 3.35" which is a good 39.5% larger in capacity compared to stock. Our larger core and the way we have designed the coolant path allows for better high end flow without sacrificing its cooling ability. We estimate our cooler core to handle upwards of 1000HP!